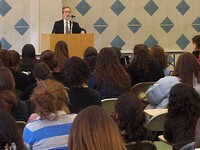 Mar 4, 2004 — This year’s annual Seforim Sale, a student-run project of the Student Organization at Yeshiva (SOY), was held from Feb. 9 to Feb. 29 in Belfer Hall at Yeshiva University’s Wilf Campus. Originally intended as a convenient way for students to purchase the necessary seforim, or religious books, for their studies at Yeshiva, the Seforim Sale has grown enormously in its 50-year history. This year’s sale offered more than 9000 titles, including the latest in rabbinic and academic literature, as well as cookbooks, children’s literature, musical recordings, and educational software. The Seforim Sale has become a calendar highlight for the Yeshiva University community, as students and alumni congregate to visit their alma mater, see old friends, and fill their shelves with new publications. The Association of Modern Orthodox Day Schools and Yeshiva High Schools, (AMODS) provided a fun and educational way for middle school and high school students to experience and appreciate the excitement of this year’s Seforim Sale. Hundreds of students from various schools visited the Wilf Campus, not only to see the sale, but also to hear arranged shiurim (lectures) by roshei yeshiva, and to tour the beit midrash (study hall) where the seforim of past sales are treasured and consistently used. A creative, interactive scavenger hunt was arranged in which students hunted for fun and interesting tidbits of information. Students also had the opportunity to hear from Yeshiva University students who ran this year’s sale to get an insider’s view on the workings of the operation.